If you are a seasoned gambler, then you must have played on at least a score or so of ancient Egyptian slots. Slots with such a theme are indeed one of the most popular around and are normally loaded down with enough features to delight even a Pharaoh! To stir up some spinning fever, game maker Microgaming has seen fit to release yet another such slot called the Treasure Nile. Rather than being loaded down with enough eye-candy, it has something far more spectacular- a progressive jackpot. If you are looking to get your hand on this, read on find out all there’s to know about the Treasure Nile slots. A Treasure Nile Like No Other! The Treasure Nile slot opens for business with five reels, a trio of rows and nine paylines. The featured icons are somewhat basic, as are the audio effects. The paylines featured here are not fixed and players can, therefore, adjust it as required. The icons on the reels comprise scarabs, sphinxes, pyramids, jackals, burial masks and ankhs. Gameplay of this slot is easy as can be and wins are made by landing a trio of matching icons adjacent to each other. The featured pyramid icon performs the role of the wild. The scatter for its part is a scarab and a burial mask is the much-coveted jackpot icon. A win both ways feature is in effect and this makes it quite easy to create winning combos. The most lucrative icon is the burial mask and is worth a maximum of 6,000 coins once five of them are lined up adjacent to each other. The next most lucrative icon is the Sphinx, with players being rewarded with 3,000 coins for landing five of them across a payline. The next is the Jackal and is worth 1,500 coins for five icons, along with an ankh that’s good for 1,000 coins when five of it is landed. Progressive Jackpot- to get their hands on the featured progressive jackpot, players are obliged to use all paylines and bet the maximum. Wins here can reach six or seven digits and grow by the second and the burial mask icon is the key to it. 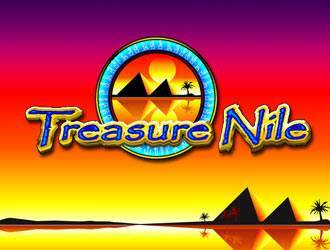 The Treasure Nile slot easily makes up for any deficiency with a progressive jackpot that is the stuff of legend and is totally worth befriending and spinning up.